The Turbo Tee is an economical, yet high performance twinax to parallel protocol converter. 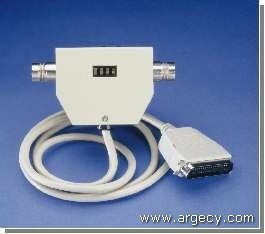 The Turbo Tee will convert any ASCII printer with a parallel port into a fully functional twinax SCS device. Ten ASCII drivers make it compatible with any printer on the market. Configuration is easy using the push-button operated menu system. Simply scroll to the desired configuration item and select the appropriate value. There is no need to send special setup strings or attach to a terminal for configuration. The Turbo Tee is ideal for attaching thermal transfer label printers to AS/400 twinax hosts. Many of these printers require special control codes that utilize the programmable pass-thru feature of the Turbo Tee. The Turbo Tee is guaranteed to print at the rated engine speed of any label printer on the market.